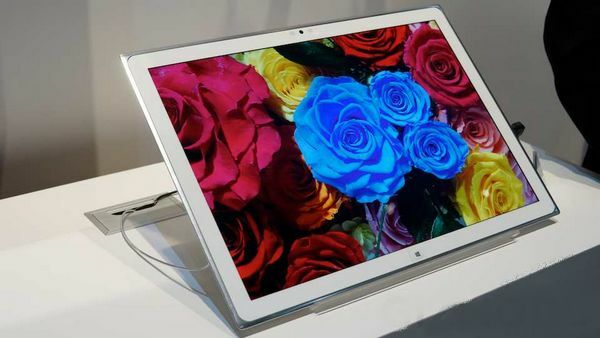 Panasonic has jumped on the 4K bandwagon, but not just in TVs: the company has a ridiculously appealing 4K Windows 8 tablet at CES, squeezing 3840 x 2160 pixels into a 20-inch frame. Officially a prototype, though one which Panasonic tells us is very likely to see production, the unnamed slate may not fit into your purse like an iPad mini, but it does have some compelling applications in graphic design, video editing, architecture, and more. Panasonic’s claim that the 4K tablet is the “lightest and thinnest” in the the 20-inch category seems a little redundant, given the scarcity of rival machines, but the rest of the specifications hold muster. As well as the 230ppi 15:10 display there’s an Intel Core i5-3427U 1.8GHz processor and NVIDIA GeForce graphics keeping things ticking along, along with 4GB of RAM (up to 16GB supported) and a 128GB SSD. Connectivity includes microSDXC, a single USB 2.0 port, WiFi a/b/g/n, and Bluetooth 4.0; there’s also a front-facing 720p HD webcam, though the absence of a rear camera is unlikely to disappoint too many people given the whole thing weighs in at 5.3lbs and measures 18.7 x 13.1 x 0.4 inches. 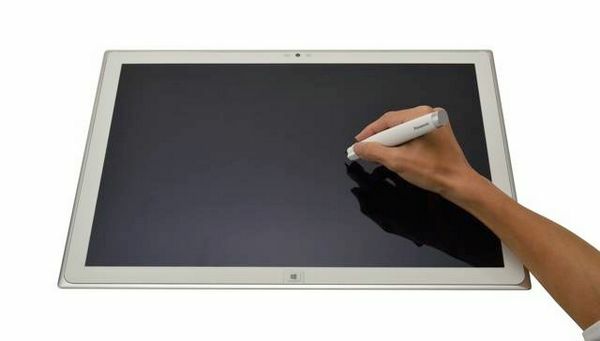 The display itself supports ten-finger multitouch, but also an Anoto-powered digital pen that can be used to annotate documents, sketch, or generally make more precise edits. 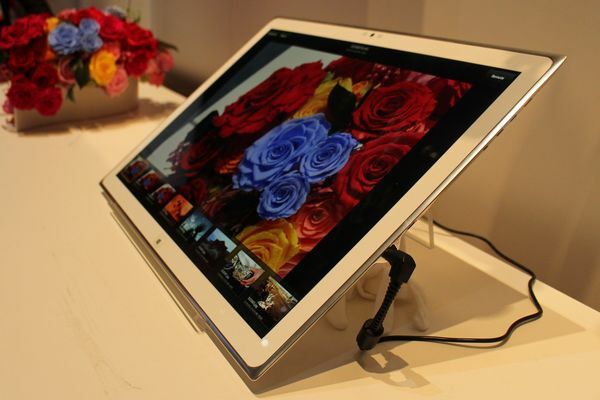 Panasonic had a few suggested uses for the slate, with one demo showing a live preview from a nearby DSLR, complete with editing tools, while another demonstrated how a pair of the 4K tablets could allow for collaborative work in different locations, each mirroring the changes made on the other. The crispness of the display is what engages you first, though, with Panasonic’s demo schematics ink-on-paper precise even when you got up close to the glass.